If you watch lot of web shows like Ustream.tv or Justin.tv, StreamDesk is for you, it brings popular web shows to your desktop in a single player. StreamDesk is a desktop application for windows and Mac for watching live streaming video from the web shows. You can see the list of all the available streams on the left side of tha app, click any stream to start the video. 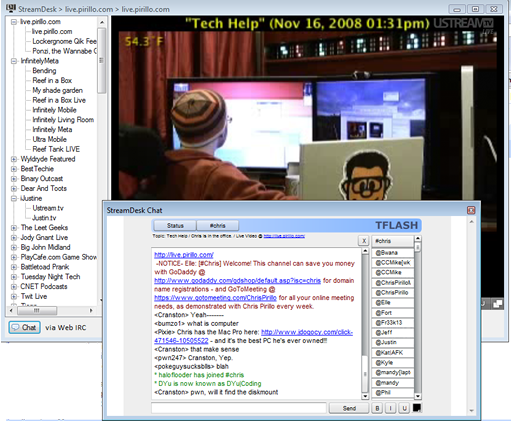 For streams like Chris Pirillo there is an option to chat via IRC Channel, the chat function opens up as a flash window and works perfectly. The list of web shows it provides is not exhaustive yet, well over 100 shows are included. If your favorite stream is missing you can request for the addition at the developers site. StreamDesk requires .Net Framework 3.5 and Flash Player 10 in IE for Windows and works on XP, Server 2003, Vista, Serve 2008. Mac OSX 10.5x or newer is supported with Flash Player 10 in Safari.